Did you know that there’s a way to try Mastercam, the world’s #1 CAM software, for free? 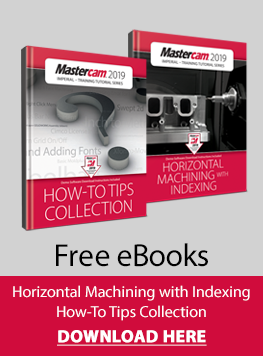 Mastercam Demo/Home Learning Edition (HLE) is available for home use to anyone that wants to learn how to use CAD/CAM software, brush up on their Mastercam skills, or check out the latest features and functionality of both Mastercam and Mastercam for SOLIDWORKS®. Despite the word Demo, Mastercam Demo/HLE provides you with much more than a trial version of Mastercam. You’ll have access to the full potential of the software, from designing a part to generating highspeed toolpaths to machine it. The only limitation is that the software will not send G-code to a CNC machine. Ultimately, Mastercam Demo/HLE gives you the ability to learn Mastercam – every step of the way up to actually machining a part.